Three of my latest paintings, that are an interpersonal exploration of the in between or the betwixt. You can view and acquire them at ROOM Fine Art Gallery gallery in San Rafael, CA. I feel all three are very mysterious and very powerful canvas's. This was has gotten some amazing international comments on my Saatchi online gallery. I began this piece three years ago. I was inspired by a sacred trip I took to canyons of the Sierra Tarahumara in Mexico. The Raramuri are the indigenous peoples that live there. I created a "tree shrine" there and I felt really connected to the land. You could peel the layers on this painting like an onion. The first layer is a green color field. Pneuma is a dark canvas with a lot of layers and light. The meaning pf Pneuma is "breath" and in a religious context for "spirit" or "soul"
This is very layered piece. There is probably five completed paintings under each layer. It is a process of going from the dark into the light. Support Our Newest Project - Take 5: Art Break Day! Please support my collaboration with Lauren Usher Odell- Art is Moving! "The time has come to give everyone in our community an opportunity to know and experience creativity as our most powerful human capacity." Visualize walking into the center of a city and seeing a group of random strangers sitting around a table chatting, laughing, sharing, and getting to know one another through the act of making art together. On Take 5: Art Break Day folks will literally be taking an art break; taking a breather from the ordinary course of their day to MAKE ART FOR FREE! 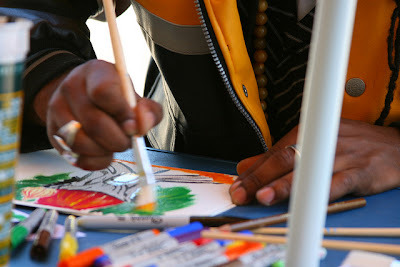 The first official Take 5: ARTbreak Day will be on September 2nd, 2011. This community ARTreach event will take course during the work day, in the cities of San Francisco, San Rafael, Richmond, Berkeley, and Oakland. In the “heart” of each city a canopy with the words “Take an Art Break” will house tables, filled to the brim with an array of art supplies! Passersby will be greeted and invited to have a seat and to take an art break. Over the next four months we need to raise $50,000. That is $12,500 per month. That is equal to 117 Venti lattes at Starbucks per day or one iPhone per day. Donate, donate, donate Click HERE to donate now! Your tax-deductible donation provides crucial support for this projec. Every single donation no matter how small or large is indispensable and intrinsic in helping us create a successful Take Five: Take an ARTbreak Day! Spread the Word! E-mail this post to your friends, post it on your Blog, on Facebook and Twitter. Become part of our ARTmentor Team. We are looking for 8 ARTmentors to help us prior, during, and after the event with several different tasks. Check out the website for more info. Volunteer. We have over thirty volunteer positions available. Have fun with us in September! Put September 2, 2011 on your calendar NOW so you don't forget to come out and TAKE AN ART BREAK for free! Take 5: Art Break Day a stellar success! !